Most of us have heard some version of this saying – “worry gives you wrinkles and gray hair.” Is there really truth to that statement? Worry or stressful situations absolutely impact our body. While we are most familiar with stress in relation to jaw clenching, difficulty breathing, sleep issues or hand tremors, it can also affect the way we age. 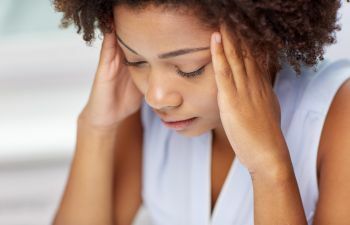 When stress goes unmanaged over a long period of time, it can contribute to a number of negative consequences within your body, including premature aging or accelerated aging. And when aging occurs, the effects are typically found on the skin in the form of wrinkles, fine lines, and sagging skin. People don’t suddenly develop wrinkles after a stressful week at work. Instead it is chronic stress that begins to impact your skin in a series of events. When stress-related exhaustion exists, blood cortisol levels become elevated. This triggers an increase in blood sugar, which subsequently leads to collagen and elastin damage within the skin. These are two building blocks of healthy, youthful skin. Without proper amounts of collagen and elastin, the skin looks less smooth, less supple and otherwise aged. There’s another reason why chronic stress can contribute to facial aging. When you are stressed, your facial muscles tend to tense or contract more often. This leads to worry lines between your eyebrows, crow’s feet and other unwanted signs of aging. What If Stress Has Already Caused Wrinkles? Whether it was that high-profile job or years of raising a teenager, many people have already suffered the effects of stress in terms of accelerated aging. While you can take strides to better manage your stress going forward, you’ll be pleased to know that there are skin treatments to reverse what’s previously been done. At Olansky Dermatology, we offer a full menu of aesthetic treatments for skin, ranging from chemical peels, laser therapy and microneedling to Botox, Juvederm and other proven facial injectables. Our physicians bring unrivaled expertise in creating a natural and rejuvenated look with the use of the most advanced and proven cosmetic skin treatments available. We understand that life can be stressful, and we welcome the opportunity to help you avoid the effects on stress on your skin!